Died: Died 30 September 1915, aged 35. Killed in action from wounds received from sniper fire while bringing in a wounded private from no man's land during the Battle of Loos (after an attack on Hill 70). He had apparently already saved a sergeant and was recommended for the Victoria Cross. Thomas 'Tommy' Charles Reginald Agar-Robartes was the eldest son and heir of Thomas Charles, 6th Viscount Clifden and Mary Dickenson, Vicountess Clifden of Lanhydrock, Bodmin, Cornwall and of Wimpole Hall, Cambridgeshire. 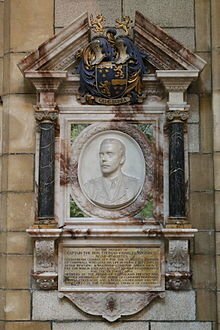 He was educated at Eton and Christ Church, Oxford, and was the Liberal Member of Parliament for St Austell and Mid-Cornwall from 1908 until his death. 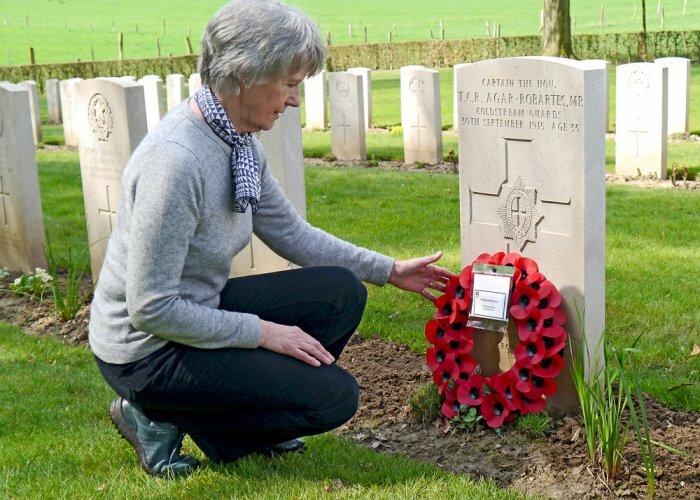 "It was at Loos that for the first time large numbers of men from Kitchener's Army - the wartime volunteers of 1914 - would fight and die in a major battle. It was a battle that would consume senior officers, war poets, sons of the gentry and public figures, and thousands of humble Tommies who felt this might be the 'Big Push' which would break the stranglehold of trench warfare. 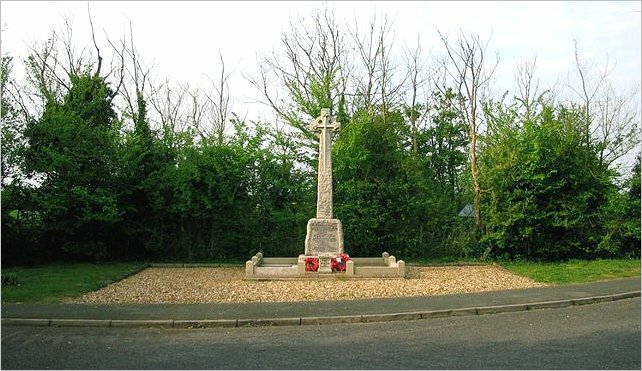 It was not to be, and in the two and half weeks of bitter fighting here in September and October 1915 more than 20,000 British soldiers would die." “Tommy Robartes was a remarkable man…devoid of fear”, according to his brother officer Lt G Barry, who recounts a remarkable musical escapade in Chapter 29 of Lyn MacDonald’s book "1915 – The Death of Innocence". "Robartes wanted to form a band in his company of Coldstream Guards, and on home leave bought the necessary instruments to do so. The band, a little ensemble of about 10 players, became so good that they were allowed to accompany route marches. "However, Tommy had sworn revenge for the loss of two sergeants during an eventful spell in the line, and he decided that the band would be the best means to settle the score . He advertised a musical entertainment in German, which they stuck above the parapet. The show would start at midnight, which indeed it did, and the Germans were treated to plenty of music to their liking, such as The Watch on the Rhine. "However, what the Germans didn’t know was that our front line had been evacuated, and the artillery had been primed to let rip on the opposing trenches three minutes into the concert." To cut several pages of Miss MacDonald’s account short, Tommy exacted his revenge, on 4th August 1915. 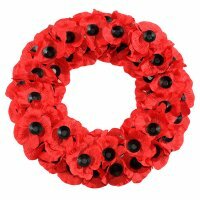 "On 13 September 1915 the Honourable Thomas Charles Reginald Agar-Robartes, Captain in the 1st Battalion Coldstream Guards, had been recalled from the trenches for his Parliamentary duties. After two days at Westminster he returned on leave to his Cambridgeshire seat, Wimpole Hall, where, on the 17 September, he spent the day at the races at Newmarket. The following day he was urgently recalled to the Western Front to help plan a military assault on the industrial mining town of Lens in north-east France. "He led his men to within 20 miles of the village of Loos, where a letter from Major General, the earl of Cavan awaited their arrival, it read ‘We are on the eve of the greatest battle in history, the future generations depend on the result…great things are expected from the Guards division’. "On the 25th Tommy’s men captured and moved into an enemy trench which, it was reported, was littered with dead bodies. From here there were further orders to advance, this time towards a wooded area and then to a chalk pit beyond. Both objectives were fulfilled but with heavy casualties. "On the 28th September, during fierce fighting and with a strong smell of noxious gas in the air, Sergeant Hopkins of the 5th Reserve Battalion was shot by a German sniper. Tommy could not abandon his comrade so, in Hopkins words ‘[Tommy] came 80 to 100 yards right across the open in broad daylight and within 200 yards of the enemy and dragged me into safety’. This unselfish, spur of the moment, action cost Tommy his life. After being hit by a German sniper Tommy died in a casualty clearing station on the 30 September." Adapted from of a Eulogy given at Lanhydrock church for Captain, the Honourable Thomas Agar-Robartes M.P. (1880-1915), 27 September 2015 by Paul Holden, FSA. National Trust, Cornwall. A trunk containing the military and personal effects of a British officer killed in action during the first world war, were carefully packed away in an attic in Cornwall by his grief-stricken mother, after he died saving an injured comrade in the First World War. In 1999, the belongings of Captain 'Tommy' Agar Robartes were found perfectly preserved after gathering dust for 84 years in the attic of his former home, Lanhydrock House in Cornwall. National Trust property manager Andrea Marchington opened the trunk. "Inside there were some of the things that he used in the trenches. A trench periscope, a monocular, his sword, walnut talc holder, moustache comb, a tiny little silver spirit lamp, and a little drinking cup inside a leather case also made of silver. Everything beautifully made, each with its own case, and giving a rare insight into a serving officer's life"
"Captain Agar-Robartes' possessions are now on permanent display at Lanhydrock and act as a poignant reminder of life at the time of the first Great War." [BBC - 11 November 1999 and others]. A memorial tablet in the Cathedral church of Cornwall reads: "To the memory of Captain The Hon. 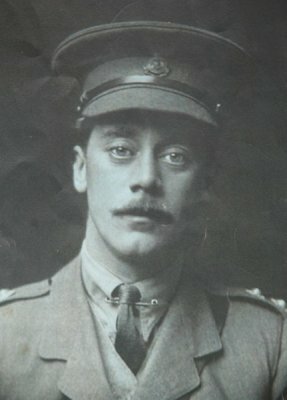 Thomas Charles Reginald Agar-Robartes, Coldstream Guards, M. P. for the St. Austell Division of Cornwall. Who lost his life in France Sept. 30th 1915, after rescuing a wounded comrade under heavy fire for which gallant exploit he was recommended for the Victoria Cross." 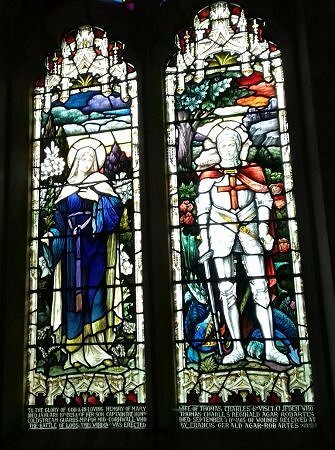 There are stained-glass windows commemorated to the memory of the Hon T C R Agar-Robartes to the right of the Chancel in the south wall of St Andrew's Parish Church, Wimpole. Cemetery: Lapugnoy Military Cemetery, Pas de Calais, France. The cemetery was first chosen in the summer of 1915, in preparation for the coming British offensive; and the first burials took place in September. There are nearly 1500 war casualties commemorated at this site. Thomas Charles Reginald Agar-Robartes for this page.